September 27-29, 2013. 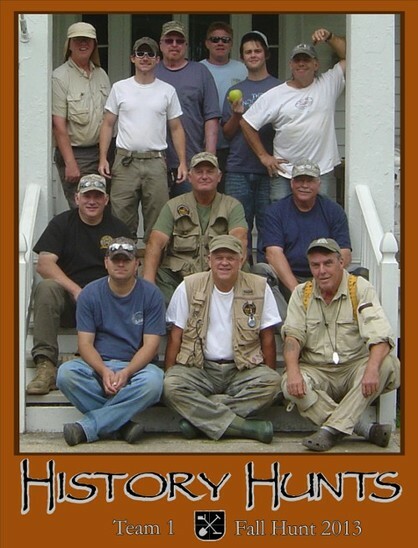 What a great relic/treasure hunt with a great bunch of guys. 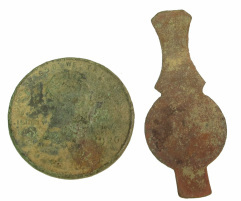 These 12 guys recovered some fantastic relics including dozens of civil war bullets, 4 confederate buttons, a 1700's spanish silver Reale, a mint 1894 Barber quarter, 2 half dimes (1841 & 1855), Indian Head and Wheatie pennies, a Shield Nickel, a 1773 Virginia Half Penny, a Large Cent, an 1800's keg tap, a rare "Bucks of America" Revolutionary War button and much much more. As I said, just a great great hunt. Top Row: FloridaChuck, LouisianaSal, TexasTom, MarylandScott, NCQuinn and NCTim. Middle Row: WashingtonTom, WashingtonGordy and Washington Dave. Bottom Row: WashingtonJake, FloridaRob and CanadianJimbo. Brass barrel (keg) Tap. Probably 1800's. This particular relic hunt was tough digging as the ground was rock hard. This Tap was nearly a foot down. It took me at least 30 minuts to dig this out as I had to pains takenly chip away at solid hard clay as to not damage the target. I was dreaming about a Confederate Buckle but was still please with this piece of history. Civil war Bullets. Minie Balls (3-ringers.) It never gets old digging these and it actually is a good sign that there was Civil War activity in the area. 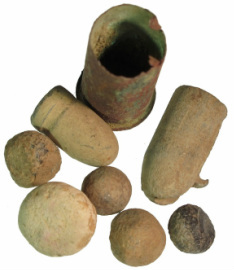 Assorted early bullets and shell casings. 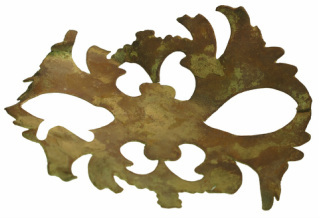 Brass drawer ornament. 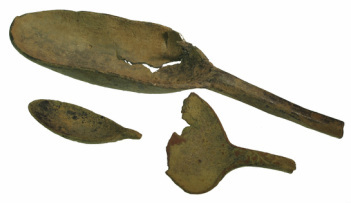 I'm guessing the actual drawer handle or pull piece fit through the two larger openings on this decorative piece. This was another difficult piece to retrieve in the hard ground. 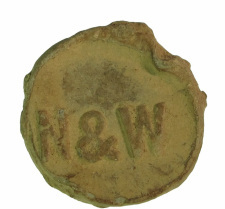 Lead railroad token, Norfolk and Western Railroad. 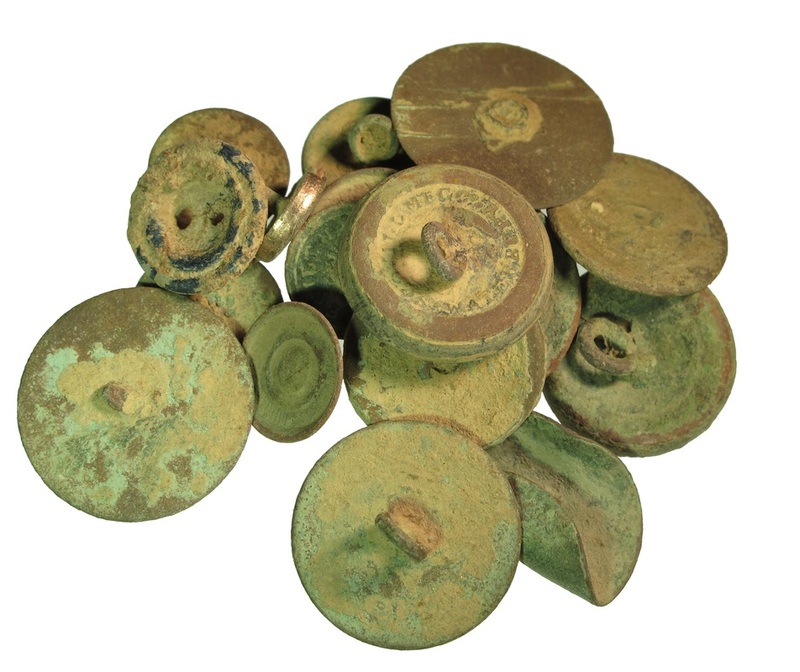 Old button backs and flat buttons. 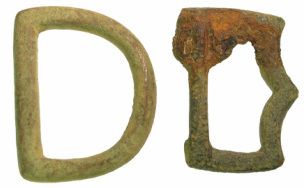 A 1926 Wheat Ear penny and an old door lock cover.